You want to create complicated searches of the metadata of the current repository that you have specified in your user profile. You also want the ability of save search criteria for reuse. You can use the Search window that you can access from the Tools menu. The search function enables you to search for objects by name, which includes the ability to search for patterns. 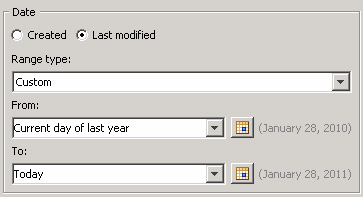 You can subset a search to a specific folder, search by type, by last change date, or by other user-defined criteria. You can also save searches to a folder and bring them up later when needed. For example, you can use the saved search feature to maintain a recently changed object list. You can specify basic search criteria in the Folder and Name sections of the Search window. 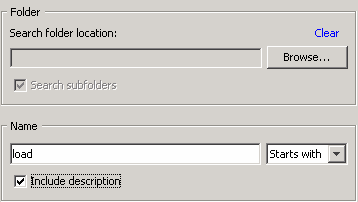 Determine whether you need to specify a folder location or a name. For this example, try specifying a name but leaving the Search folder location blank. Enter text that you want to find into the Name field. 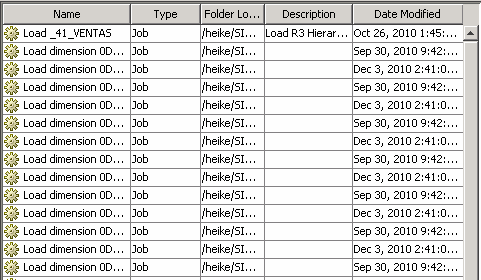 Enter load and select Starts with in the drop-down list. Finally, select the Include description check box. So far, you are searching for objects that begin with the text load. You are also searching in description columns. You can use the Types section of the Search window specify the types of objects that are included in the search. By default, all of the types are select. However, you can easily create a more selective list. Click Clear All to deselect all of the object types. 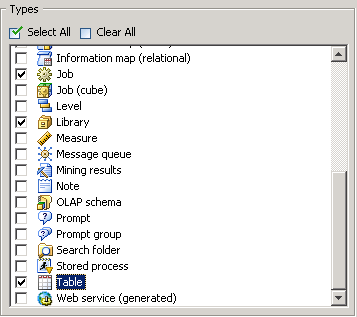 Select the object types that you want to include in the search, such as Job, Library, and Table. You can use the fields in the Date section of the window. Click Advanced to further restrict the search by specifying keywords that the object must have or by specifying a responsible party the object must have. A responsible party is specified by a person's name and the person's role for the object. Click Search to run the search after all the criteria have been entered. Click Save to save the criteria for the current search. You can specify the name and location of the saved search. Right-click a saved search, and then click Open in the pop-up menu to reuse it and the criteria that it contains. Note that a selected search runs immediately when you open it. Some searches can take a long time to execute.